Also, I started writing the first book, Origins on October 21, 2013. I published the fifth book, Immortals on February 8, 2014. That means I cranked out five full length novels including the covers in three and a half months. Tomorrow I’m starting work on the sixth book. Craziness! Immortals, book 5 of the Unseen Things series is now available! I am very happy to announce that Immortals, book five of the Unseen Things series is now published and available! I’ve also removed “Unseen Things:” from the titles of all of the books in the series, so now they’re strictly going by their actual titles instead. Synopsis: None of them realized at first who the mysterious woman was who showed up at their door after the party that night. None of them would have ever believed it could have been their mysterious rep, who up to this point they’d been barred from having any personal contact with. Yet here she was in the flesh, and she had a gift with her from the backers that would change their lives very literally forever. Book 5 of the Unseen Things series is now complete! 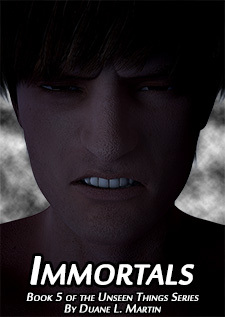 Immortals is nearing completion and a title change. I just finished chapter 14 of Immortals. Just two more chapters to go before it’s finished. Once I get Immortals published, I’m going to completely go through all the book listings and remove Unseen Things: from the titles. From now on, they’ll just be named what they are without the series name in front. So, Origins, The Hunt, Exploration, Revenge and Immortals. I’m doing this because it’s not only better form, but it’s also caused problems with sites like Goodreads. The new files are ready to upload for all the books, I just have to take care of everything once Immortals is done and published.